Tiny frogs and lizards surviving in Haiti’s last splinters of forest show that even the most devastated areas can be redeemed. A report by Faye Flam for Bloomberg. A glass-half-full attitude about our planet might seem naive in this age of melting ice caps, plummeting animal populations and warnings of impending climate-change catastrophe. In extremely degraded places such as Haiti, the glass appears 99 percent empty: A new study shows that almost all of the Caribbean nation’s original forest has been turned into farms and naked dirt. I probably would have absorbed this news as another tragic defeat, but in visiting that last sliver of forest I saw that even the most desolate and ravaged areas can be redeemed. Improbably, a fairly tale world of miniature frogs and lizards survives in Haiti — dozens of species found only in that environment. Wildlife doesn’t always disappear in proportion to lost forest, but clings to what’s left, waiting for one final collapse. In a scientific paper published in November in the Proceedings of the National Academy of Sciences, researchers estimate that with the current rate of deforestation, the ecology will collapse within the next 20 years. The pace of destruction is staggering. When I was there, tagging along with a biology expedition in 2011, forest covered .45 percent of the land; now it’s about .28 percent, meaning that in the seven years since my visit, Haiti has lost 38 percent of its forest cover. The desperate and hungry continue to cut down the trees for cooking fuel. The remains of a former paradise crown just eight of 50 mountain peaks poking into the clouds. Islands tend to do weird things to evolution, often producing miniature versions of animals. And in Haiti this has given rise to dozens of species of vividly colored miniature frogs, many small enough to fit on a quarter. There were also tiny lizards of different colors and patterns — even one with zebra stripes. Each species signaled to potential mates with a different call, so when dusk fell, the air filled with a chorus of chirps, trills and warbles. Temple University’s Blair Hedges, who headed my expedition and is an author of the PNAS paper, said many of these reptiles and amphibians are endemic species, meaning they don’t live anywhere else. Separated from other bits of forest by miles of barren land, they can’t get to the Dominican Republic, which occupies the less rugged eastern side of Hispaniola. So they remain stranded on ever-shrinking islands within an island. Saving these forests is not just the sentimental wish of meddling tree-huggers. Haitians told us they wanted to preserve the forests, which are officially on protected lands. Forests play a role in preventing water contamination and protecting all kinds of organisms. The people of Haiti will need to move to a more sustainable way to cook their food eventually. Nobody benefits from waiting for all the trees to be killed before stepping in to help. Haiti is among the world’s most ecologically ravaged countries, but other parts of the world are also quickly losing their biological diversity. A new report by the World Wildlife Federation took stock of the world’s vertebrates — mammals, fish, birds, reptiles and amphibians. The WWF sampled 16,704 populations, defined as members of a species living in one geographic area, and found that on average, their ranks had decreased by about 60 percent since 1970. That is, the average population is shrinking, some quite drastically. Forests can be replanted, and perhaps when Haiti acquires a sustainable source of fuel, they will be, but the diverse array of other species that lived among the trees will be lost forever. 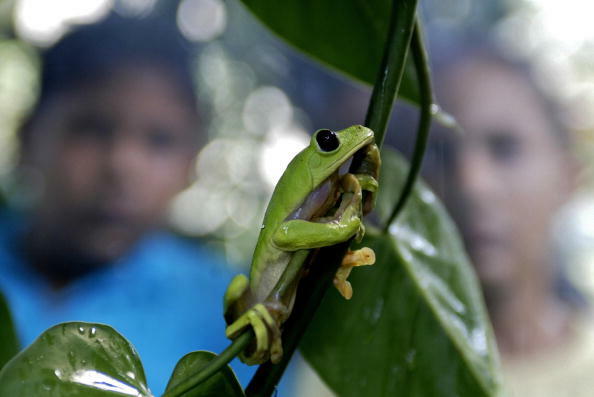 The scientists did bring a few frogs back to the Philadelphia Zoo, but not all of them can breed in captivity, and if the forest collapses, other species might be lost before they were ever discovered. The famous biologist and writer E.O. Wilson has estimated that the planet hosts about 10 million different species of living things, and that about half will be extinct by the end of the century if humans don’t set aside some space. Considering that we’ve only cataloged 2 million, it means most of those lost will be forever uncatalogued. Intuition would tell us that if more than 99 percent of a forest is gone, then it’s as good as dead. But in ecology, even a fraction of a percent of a forest can support a whole world of life, color, form and musicality. It’s even more cheering to think that of all the great diversity of life that’s been discovered, there remains an even greater bounty that’s still unknown. If we do let the glass go 100 percent empty, though, there’s no refilling it the same way.